To request that we contact you to schedule an appointment, or make boarding reservations. To request medication refills for an existing patient. To update your contact information (address, phone, email address). To ask other general questions. 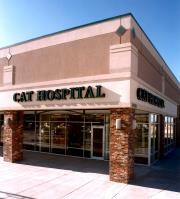 And if you'd like to share a testimonial about your experience at Purrfect Health Cat Hospital. While we will make every reasonable effort to check our email messages at least twice a day, if you have an urgent medical question or other time-sensitive questions please call us at 303-790-2287. Please understand that we will not give specific medical advice via email (especially if we have not established a relationship with you and your cat).